All-in-one solution for HD video and slideshows on disc! Import HD and standard-definition video from camcorders, TV, digital cameras or mobile phones. Easily create slideshows and transform video clips into polished movies with opening sequences, titles and music. Design stunning Hollywood-style motion menus with state-of-the-art effects using professionally-designed templates. Record video direct to disc, create music discs, back up data and play DVDs and AVC HD discs. Show off your high-definition Blu-ray Disc®, AVCHD or standard DVD movies on the latest HD home theater systems. 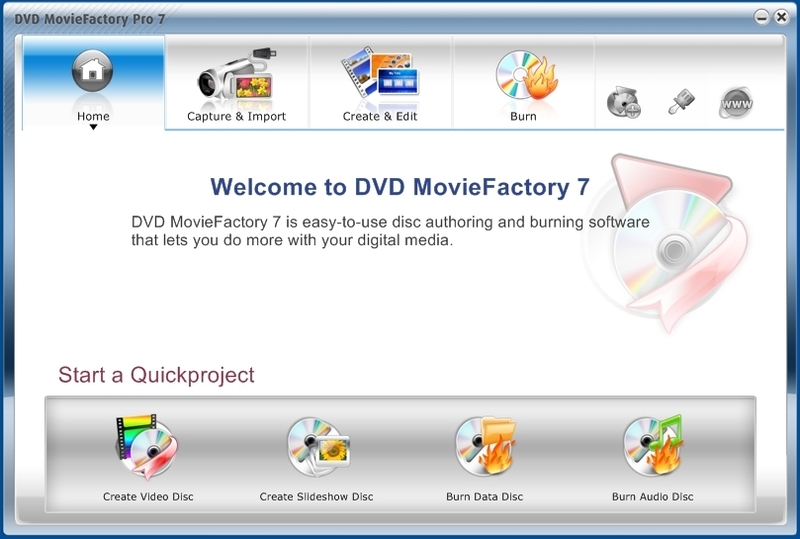 As a complete disc-authoring solution, DVD MovieFactory Pro 7 lets users create data backups on CD, DVD, or Blu-ray Disc and burn audio CDs, DVDs, or MP3 discs. Users can compile TV shows from set-top recoreders, burn downloaded DivX movies to disc, and make quick copies of CDs, DVDs, or non-commercial Blu-ray discs. For unrivalled convenience, the Quick-Drop desktop icon lets users drag music, video, and data for automatic burning. With Label@Once, users can even design and print custom labels for their discs. What’s more, users can simply connect a source to capture DV or HDV directly to DVD, AVCHD, or Blu-ray disc.